If your a pizza lover, your in for a treat. My family devoured this pizza and most of them do not like spicy. Great flavor with a hint of spicy. Let's start by making the red sauce for the pizza. I recommend doing this the day prior to the cook so the flavors have time to meld together over night. Place the following into your blender. 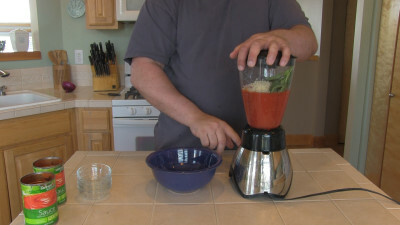 Blend the contents on high for 10 seconds then pour the sauce into a medium mixing bowl. Cover and place in the fridge over night. This will allow the flavors to meld nicely together. In this cook I used some left over slow cooked chicken that I pulled and sauced. If you you don't have left overs just slow cook or fry up a couple chicken breasts or thighs. Pull the meat and sauce it up. This recipe also calls for about 6 to 8 slices of thick sliced bacon. 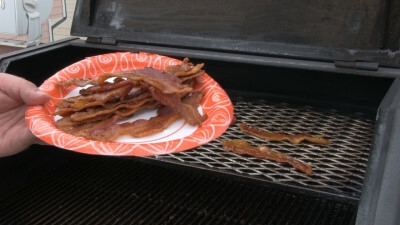 I cooked mine fresh @ 240 degrees until the bacon was not quite all the way done and was still soft. It will cook more while cooking with the pizza. In the video you will see more then 8 slices. Well my wife had to have her bacon fix. You know what they say... Happy wife happy life. 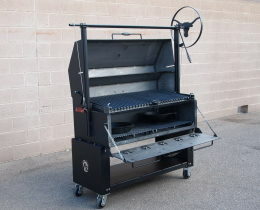 Once the bacon is done I fired up my Scottsdale with oak lump charcoal. Once the charcoal was burning hot I adde two pieces of peach wood to the fire. I ran the cooker as hot as I could get it Approximately 600 degrees. I built my fire on the left side of the pit and placed my pizza stone on the left side grate. Now lets get the pizza built. 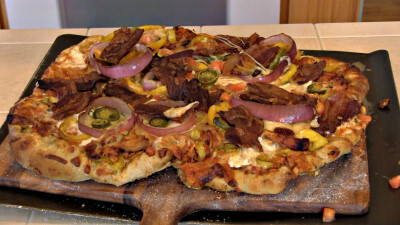 In this recipe I used a store bought pizza dough usually found in the deli section of your grocer. I went with a garlic herb dough. Shake some flour on a flat surface. In my case I used a pizza peel. Place your dough on the flour and start working the dough while turning it over frequently. I like to pick mine up and rotate it while allow the weight and gravity to stretch he dough as I work my hands around the edges of the dough. See the video for more information. Once the dough starts thinning out lift it up and liberally shake some corn meal underneath on your pizza peel or baking sheet. This will allow it to slide off the peel or sheet onto the pizza stone. If you do not have a pizza stone simply cook it on the baking sheet. 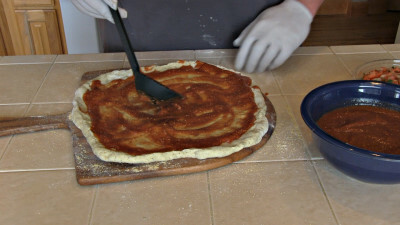 Once the dough is in the desired shape or what I consider as close as it's going to get, pour on a couple ladles of sauce and spread it around evenly. Now add a nice layer of shredded white cheddar cheese. 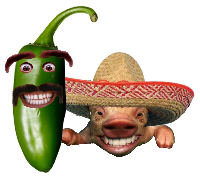 Follow the cheese with some Pico De Gallo. Next slice a 8 oz. Mozzarella ball into about 10 slices and lay them out evenly around the pizza. Add about a 1/4 cup of pepperoncini rings. I used the hot Pepperoncini's. The next topping will be the BBQ chicken. Evenly lay the chicken around the pizza. Once the chicken is on its time to place on the pepper rings. The yellow bell pepper rings go on first followed by the Anaheim pepper rings. Add about 5 to 6 slices of red onion rings. Lightly sprinkle on some shredded white cheddar and then some more Pico De Gallo. Your basically adding as much of this as you want. I went light with mine. Now its time to add the bacon. Try to evenly distribute the bacon around the pizza. Lightly sprinkle on some more shredded white cheddar. It's time to add some Jalapenos and 2 cloves of chopped garlic. II highly recommend Mad Hunky Pizza Shake liberally applied if you have it. I was out so I was out of luck. 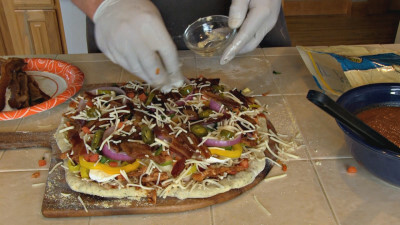 It's really a must have when building your own pizza pie. Now that the pizza is built, transfer it to your cooker. 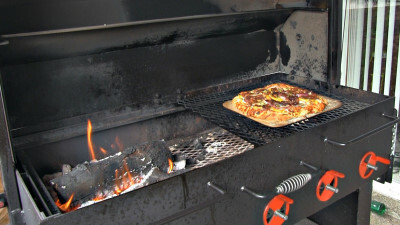 Since cooker temps may vary so will cook time and the end result of the crust. In my case the cook time was 16 minutes. As you can see I tore the pizza a bit getting it off the pizza stone. My new pizza peel is a wooden one and is a bit thick and not as easy to get under the pie as the thin metal pizza peels. I'm going back to the metal peels. There it is. 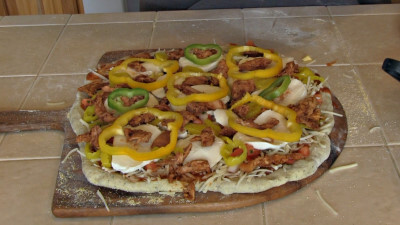 BBQ Chicken & Bacon Pizza! Oh man was it good. It didn't last long at all either.